WASHINGTON The number of Americans seeking unemployment aid fell to a seasonally adjusted 340,000 last week, driving down the four-week average to its lowest level in five years. The drop is a positive sign ahead of Friday's report on February job growth. Applications for benefits fell 7,000 in the week ended March 2, the Labor Department said Thursday. That's near five-year lows reached in January. And the four-week average, a less volatile measure, dropped 7,000 to 348,750. That's the lowest since March 2008, just a few months into the Great Recession. Weekly applications are a proxy for layoffs. When they fall, it suggests that companies are shedding fewer jobs. More hiring may follow. The decline adds to other evidence that hiring may have been better last month than economists forecast. 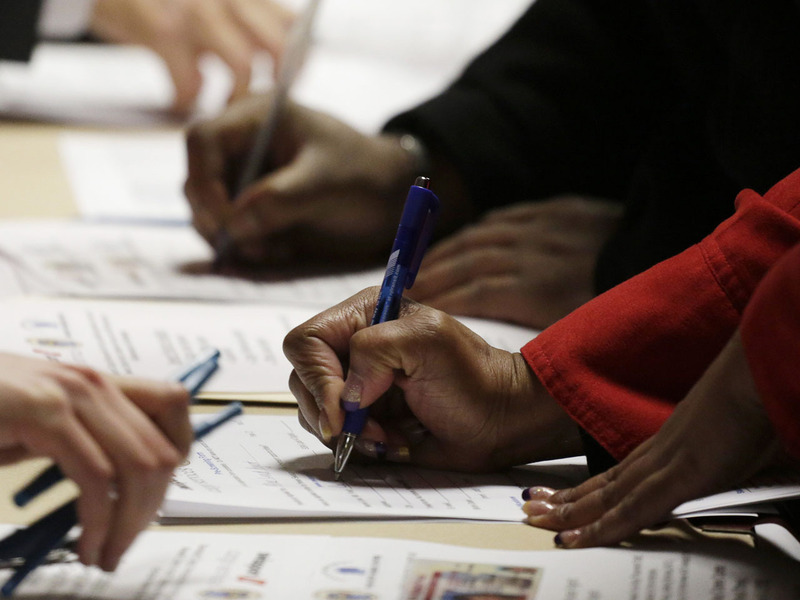 Analysts predict that employers added 152,000 jobs, according to a survey by FactSet. That's about the same as in January. The unemployment rate is projected to fall to 7.8 percent from 7.9 percent. The economy generated an average of 200,000 jobs a month from November through January. That was up from about 150,000 in the previous three months. In January they added 157,000. Several reports this week suggest hiring remained healthy last month. Payroll services provider ADP said Wednesday that businesses added 198,000 jobs in February, above most analysts' expectations. And January's hiring was revised higher by 23,000 to 215,000. Services firms, including retailers, restaurants and construction companies added jobs at a healthy clip, according to the Institute for Supply Management's monthly survey. An index of hiring by service companies slipped but remained near January's seven-year high. The ISM's manufacturing survey found that factories also added workers in February, too, though at a slower pace than the previous month. The number of people receiving unemployment aid fell to 5.4 million in the week ended Feb. 16, the latest data available. That's a drop of 362,000 from the previous week. Some of the decline is likely because people found work. But it is also because many have simply used up all the benefits available. Strong auto sales and a healthy recovery in housing are spurring more hiring and economic growth. Builders started work on the most homes last year since 2008. New-home sales jumped 16 percent in January to the highest level since July 2008. And home prices, meanwhile, rose by the most in more than six years in the 12 months ending in January, according to real estate data provider CoreLogic. Companies are laying off fewer workers despite concerns about the impact of higher taxes and government spending cuts. Social Security taxes rose two percentage points Jan. 1, reducing the typical household's income by $1,000. And $85 billion in across-the-board government spending cuts kicked in March 1 after the White House and Congress failed to reach a deal to avoid the reductions. The cuts could slow economic growth and cost 700,000 jobs, according to the Congressional Budget Office. They could also reduce unemployment benefit checks for those out of work for more than six months by about 11 percent, according to the National Employment Law Project. Benefits average about $320 per week nationwide.